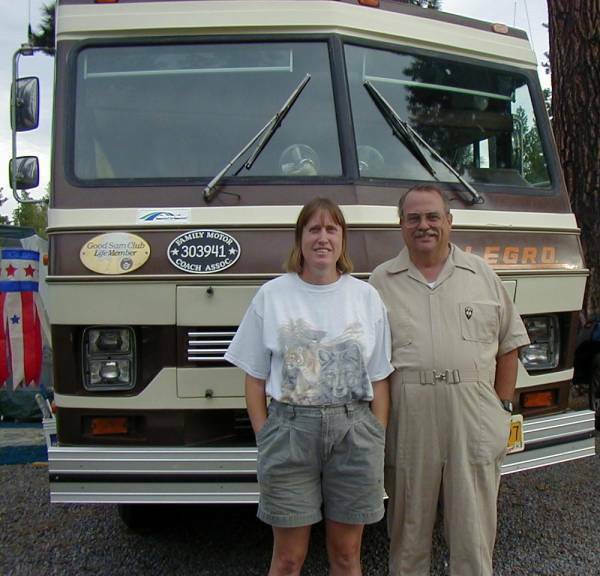 Yvonne and Norm got their first RV, a 19' Layton Funtime travel trailer, in 1993. After only a few years of only occasional use, they moved into it full-time in February 1999. Thus began a long-planned "Adventure" intended to take them to a wide variety of places. In 2002 the trailer was replaced by a 31' 1985 Allegro motorhome. Then over Labor Day weekend in 2006 a fire in the Allegro's engine compartment spread through much of the front of the vehicle essentially destroying the rig. Most of its contents were either irretrievably burned, melted, heat and/or smoke damaged to the point of being lost. About a month later a 1989 33' Suncrest took its place. The "Roving Rowes" website was set up to chronicle many of the interesting places and events encountered in this project. Unfortunately, it has gotten rather out-of-date but we hope to get it caught up sometime reasonably soon. So far our travels have taken us to various parts of Arizona, Arkansas, California, Georgia, Missouri, New Mexico, Oklahoma, Oregon, Tennessee, and Texas. Eventually we hope to get to every state and the various provinces of Canada with possible excursions into Mexico. Our RV-related associations include the Good Sam Club (Charter Lifetime Members), Family Motor Coach Association, and Kampgrounds of America (KOA).